There are two methods used to attribute credits to academic units. Course credits are attributed to a department based on that department’s “ownership” of a curricular subject. For example the Department of Botany (A4813) is the “owner” of the subject of Botany (208). Under this approach, the student credit hours in all Botany courses “belong” to A4813, without regard to who is teaching the Botany course sections. In the case of cross-listed courses, the credits of students who registered for the course as a Botany course belong to A4813, while the credits of students who registered for the course under one of the cross-listed subjects belong to the other departments. Under the Credits Follow the Instructor (CFI) method, student credit hours are attributed to the department that pays the salary of the instructor of record. For example, if the Department of Botany (A4813) offers a course under the Subject of Botany (208), and the instructor of record is a professor in Plant Pathology, and is paid under Plant Pathology, then the student credit hours in this particular Botany courses “belong” to Plant Pathology. If the course is cross-listed between Botany and Plant Pathology, then the student credit hours still accrue to Plant Pathology. Each year, the Data Digest contains a summary page showing the differences between these two methods at the school/college level. A Tableau workbook showing credits by school/college and department is available by clicking on the image below. This workbook can be used to see trends in fall and spring credits by school/college and department based on student level, course level, and type of instructor. Instructions are included in the visualizations for how to download the data tables for local use. The CFI methodology is fairly complex. An overview of the components of CFI is provided. More details can be found in the document “The ABCs of CFI”. 1. Identification of Courses and Course Sections. CFI includes all courses taught in either the Fall or Spring semester of a given year if at least one student is enrolled on the 10th day of class (the official census date). The named instructor(s) of each course section are identified from the official listing of courses maintained by the Registrar based on information provided by departmental curricular representatives when the schedule of classes is prepared. 2. Identification of Instructor Instructional Appointments. The October (for fall courses) and March (for spring courses) payrolls are used to identify the departments that are paying the instructor of each course section. CFI identifies all departments that are paying course instructors with instructional funds (program 2) because this is where instructional activity is expected. 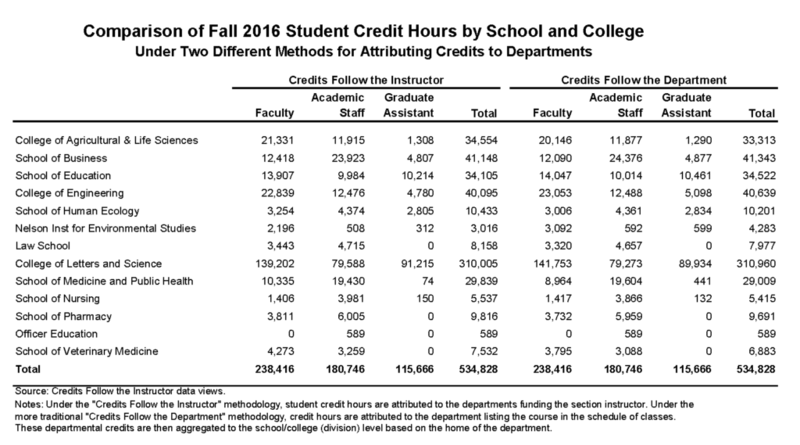 Credits do not “follow” instructors to departments that are paying instructors to perform other functions such as research, public service, or administration. 3. Conversion of Course Credits to Section Credits. Normally, course credits are only attributed to the graded (primary) course section. In a course with multiple sections (i.e. lecture and discussion and/or lab), the total course credits need to be divided among sections so that the credits can “follow” the instructor of each section. 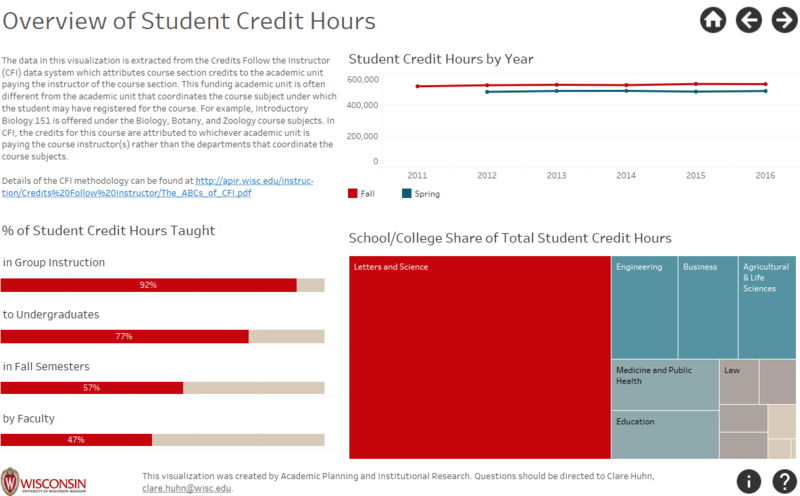 The total instructional time in each section (in minutes) and a weighting factor (used for all course sections) for the type of section (a lecture carries more weight than a discussion) both combine to determine how the credits are divided. 4. Identification of Instructional Department Homes. Instructional departments are the homes to tenure-track faculty or the curricular home of a curricular subject listing. Credits can only “follow” instructors to instructional departments. 5. Allocation of Section Credits to Instructional Departments. Once all the semester courses and sections, instructors and instructional appointments, and instructional departments have been identified and the course credits have been converted to section credits, these variables are used to allocate credits to departments based on the funding of the section instructor. Because of the complexity of departmental appointments and funding, CFI has “rules” that determine how credits are allocated. The ultimate goal is to identify which department keeps the “following” credits. When multiple options exist then these rules help determine the most likely department funding the instructor. Following are the most common examples of credit allocation rules. If an instructor has one and only one instructional appointment in a teaching department, then the instructor’s credits all go to that department. If the instructor has instructional appointments in multiple teaching departments and more than one of those departments has ownership of the course offering (i.e. a cross-listed course), then the instructor’s credits are shared by only those departments, prorated by the FTE of the instructor’s appointments. If the instructor has instructional appointments in multiple teaching departments and none of those departments has ownership of the course offering, then the instructor’s credits are shared by the departments, prorated by the FTE of the instructor’s appointments. If the instructor lacks an instructional appointment in a teaching department, then the instructor’s credits stay with the department having ownership of the course Subject. If the course is cross-listed, the departments that share ownership of the course receive the instructor’s credits in equal shares. Feedback, questions or accessibility issues: apir@provost.wisc.edu.